Take a look at our recommended graphic novel solicitations scheduled for release from January 2019 onwards. Cyclops. Iceman. Angel. Beast. Marvel Girl. The original X-Men assembled by Professor X years ago were brought to the present to find a world they barely recognized but were determined to help. 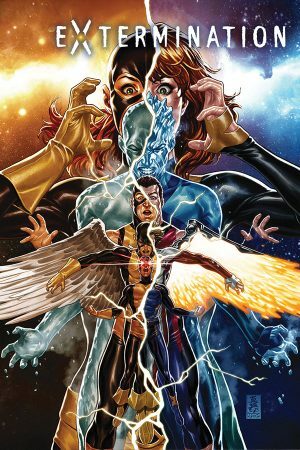 Now mutantkind’s future lies squarely in the hands of its past! With Ahab hunting the young mutants, and an unexpected yet familiar face targeting them for his own mysterious agenda, the present-day X-Men are called to arms to protect the original five. If even one of them perishes, the future is lost. But how many – and who – will die protecting them? To safeguard the timeline, the X-Men must risk everything to answer the biggest question of all: Can the original five’s fate be changed? Collecting Extermination #1-5, plus the Extermination stinger pages. 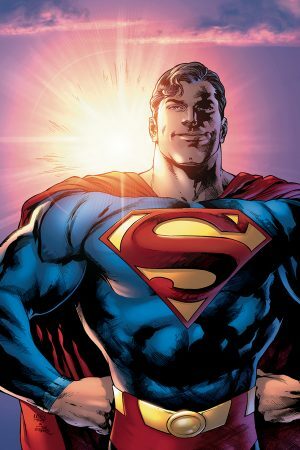 The fallout from the Man of Steel graphic novel has Clark looking at the world through new eyes… with new ideas about what Superman could and should do for the city of Metropolis and the planet Earth. His first job? Getting the planet back out of the Phantom Zone! A bold new chapter for the greatest superhero of all time and one of the greatest creators of his generation begins here, as Bendis and artist Ivan Reis begin their run on the all-new Superman! This graphic novel also serves as a sister series to Bendis’ new run beginning in Action Comics Vol. 1! Following their last battle, Dr. Eggman’s been mysteriously absent from Sonic’s life. What shocking secret will Sonic discover when he learns the bad doctor’s whereabouts? 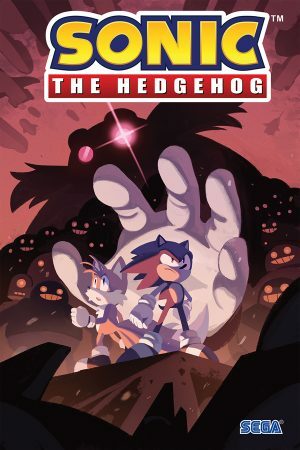 Plus, Sonic isn’t the only one looking for Eggman – so’s his old rival Shadow the Hedgehog! There are twists and turns in the course of this high-speed, action-packed mystery-adventure! But with a little help from his friends – including a new ally – Sonic’s fast enough to overcome any obstacle! Collects issues #5-8 of the ongoing series. 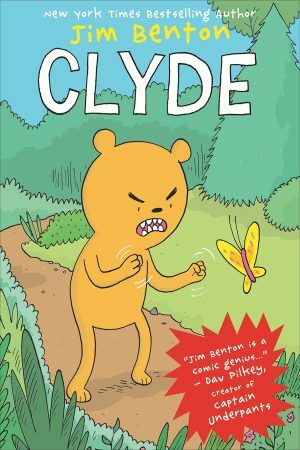 This eight-time Eisner Award-winning comic book series blending fantasy and humor features the adventures of paranormal pets investigating the horrors of Burden Hill. A heroic pack of canines known as the Wise Dogs sets off on a mission to clean up a Pennsylvania corridor plagued by seemingly unrelated occult disturbances that include a fire salamander and a horde of mutant lurkers. A link is found among the various disturbances, leading our heroes to a mountain village inhabited by a survivalist witch-cult who have discovered the existence of a “Blood Lure” attracting occult forces, creatures, and many more terrors to Burden Hill! 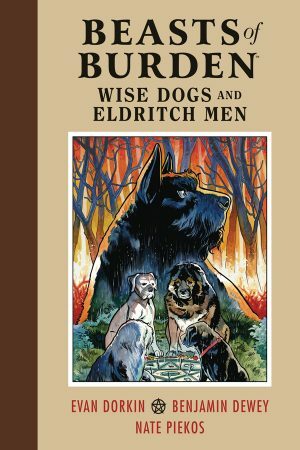 This volume collects the comic-book series Beasts of Burden: Wise Dogs and Eldritch Men #1-4. First time in print! 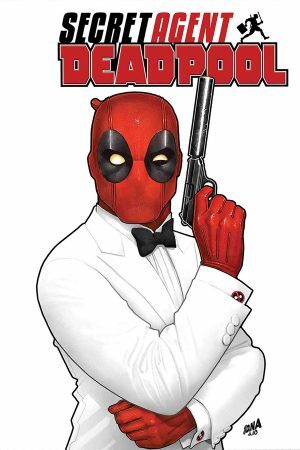 It’s a Marvelous case of mistaken identity when Wade Wilson, the Regeneratin’ Degenerate you know as Deadpool, kills the wrong secret agent – and has no choice but to take his place and complete his mission! But can Deadpool keep an object of paradoxical power out of the wrong hands? Pitted against the deadly terrorist organization called GORGON, it’s up to Wade Wilson to finish what his superspy victim started as only Deadpool can – with excessive violence, a healing factor and more than a few laughs along the way! Barbarella’s never ending quest to repair her ship’s regulator and be on her way takes a detour to Falladim, where there’s a rush on for R.U.S.T. – Radically Unstable Space-Time! The rarest and most valuable stuff in the universe, even Barbarella can’t resist its mighty call. But competition brings out the worst in humans and aliens alike, and the Siren of Space is about to see what the worst really is! 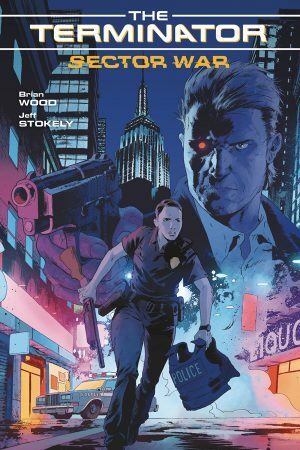 Collects Terminator: Sector War #1-4. 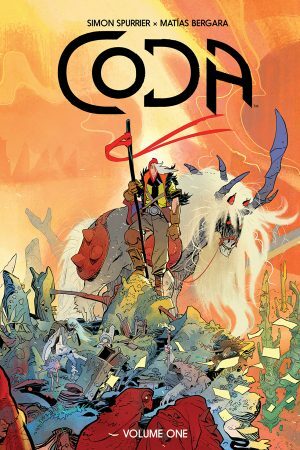 Simon Spurrier (Sandman Universe, Godshaper) and Matias Bergara (Cannibal, Supergirl) present a broken fantasy world that’s perfect for fans of Mad Max and The Lord of the Rings. In the aftermath of an apocalypse which wiped out nearly all magic from a once-wondrous fantasy world, a former bard named Hum (a man of few words, so nicknamed because his standard reply is “hm”) seeks a way to save the soul of his wife with nothing but a foul-tempered mutant unicorn and his wits to protect him… but is unwillingly drawn into a brutal power struggle which will decide forever who rules the weird wasteland. Dear Dumb Diary has sold almost nine million books, and three recent titles in the series have been New York Times bestsellers. The series Franny K. Stein has sold over a million books, and is now on the seventh book in the series. Lost cities aren’t the stuff of myth! They exist right under our feet. When her archaeologist father goes missing, teenager Hel Coates rallies her friends and brother to find him. They’ll have to dodge a shady corporation, mercenaries and speeding subway trains while they follow the trail deep into the tunnels under Manhattan – and what they find down there will change their lives forever. Follow Hel and her friends on a coming-of-age journey through subterranean tunnels, and ultimately to the holy grail of lost cities: Atlantis! 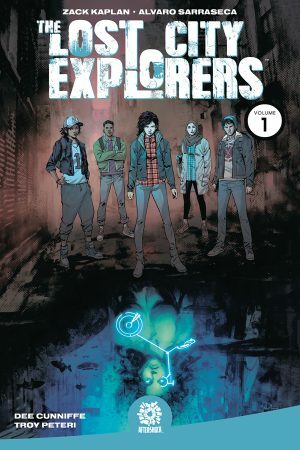 Zack Kaplan (Eclipse, Port of Earth) and Alvaro Sarraseca (Magnus, Turok) bring you an adventure story unlike any other, collecting the whole series (issues #1-5). The legend returns! 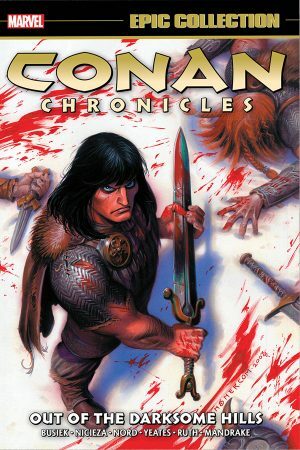 Conan the Barbarian stars in epic tales by comics veteran Kurt Busiek – including classics adapted from the works of original author Robert E. Howard! Whether he’s warring with the violent Vanir or meeting a Frost Giant’s daughter, Conan’s savage sword is always close at hand and ready for battle! The story of “The God in the Bowl” is presented in all its terrifying detail – introducing Conan’s notorious adversary, Thoth-Amon! But who is Janissa the Widowmaker, and what role will she play in the Cimmerian warrior’s life? Beware the Horror on Uskuth Hill – and the Thing in the Temple! And when two Nemedians walk into a bar, it’s no joking matter. Prepare for swords and sorcery of the highest order with the greatest barbarian of them all! Brought to the feet of the magical wizard Shazam at the Rock of Eternity, Billy Batson is imbued with powers beyond any mortal man. 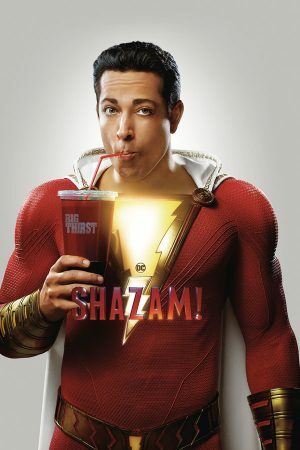 By shouting the wizard’s name – Shazam! – the young teen is mystically transformed into the powerhouse known as Captain Marvel! Now given abilities that make him Earth’s Mightiest Mortal at the utterance of a simple phrase, will Billy make the right choices and do what it takes to become a hero? Or will he succumb to the poor choices of youth-and the villainous Black Adam? Collects Justice League #0 and #21, plus backup stories from issues #7-11, #14-16 and #18-20 with a photo cover from the upcoming Warner Bros. film starring Zachary Levi!